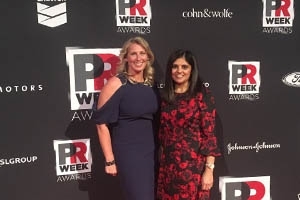 Strategic Communication professors Pallavi Kumar and Dina Martinez at the 2017 PRWeek Awards. PRWeek US has selected American University's School of Communication as one of five finalists for "Outstanding Education Program." AU has the longest-standing PR Program in the Washington, DC area, which has become one of the top programs of its kind; College Magazine put its master's degree in the top three in the nation. Adding a significant number of new professors and faculty members over the past few years has elevated the program’s professional experience and widespread regard while also reducing the faculty-student ratio. A wide range of courses offered at various times throughout the week both online and on campus makes pursuing a degree in PR attainable with any schedule. Courses include: social media strategies & tactics, international PR, grassroots digital advocacy and crisis communication. With 300+ undergraduate students the PR program boasts the largest undergraduate major in the School of Communication and there are over 80 graduate students enrolled in the program which is one of only five accredited PR MA programs in the world. After graduation, AU strategic communications students have a reputation of landing jobs at a variety of prestigious agencies from non-profits to think tanks & consulting firms to government agencies. Check out this video for a glimpse into what the master's program in strategic communication has to offer and to see what AU students learning and how they are applying it to internships, projects and in their careers.